The tool enables users to upload MBOX to Office 365 account with help of its cutting-edge features. This helps in tackling with all complexities of migration procedure in a hassle-free manner. The Exporter is capable of moving mail folders from multiple MBOX files at a time and directly exports them to Office 365 tenant. Software authenticates the username and password entered by the customer. If the validation procedure fails then, it means that mentioned credentials are wrong. To experience a successful migration process, enter the valid Office 365 id and password either of a user or an administrator. For an administrator, the major requirement to upload MBOX to Office 365 is an impersonation. 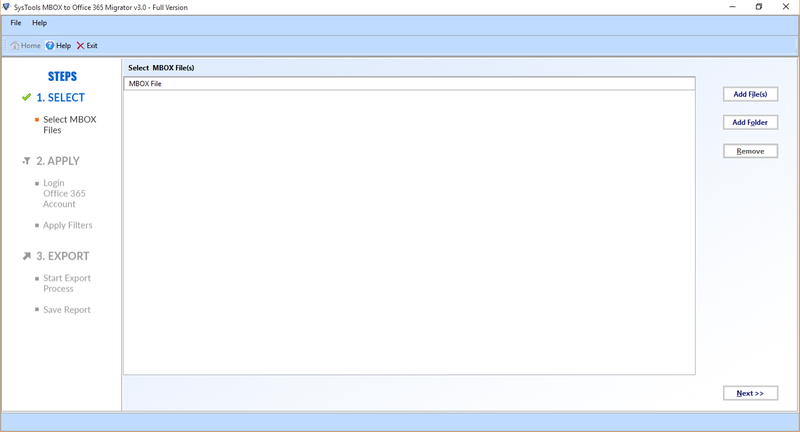 This feature is also imposed in Thunderbird to Office 365 Exporter at the time of importing MBOX emails. It will move several MBOX files to multiple Office 365 account all at once. SBD is a file format i.e. created for each folder individually. 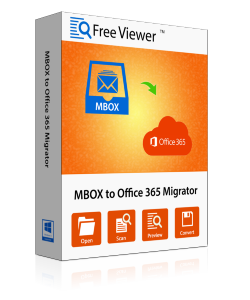 Using MBOX to Office 365 Migrator tool, one can migrate SBD file to O365. The software can export a bulk number of MBOX files to Office 365. Due to this feature, the process becomes fast & accurate. There is a Date Range Filter option for selective conversion of MBOX files. A user needs to provide a date in “From” and “To” column. After that, all the MBOX files from that range will be displayed. One can easily export those MBOX files to office 365 account. It becomes possible with MBOX to office 365 Exporter tool to move unhealthy files to O365 account. One can also convert deleted files without any difficulty. Users can also migrate their deleted emails in folders such as Inbox.mbox, trash.mbox, sent items.mbox , etc into Office 365. After completing the Export process, the software generates an Export Report which you can save in CSV file format. That file can be opened and viewed in Excel sheets. With the help of MBOX file to Office 365 Migrator tool, you can save the CSV file for future reference. MBOX file to Office 365 Migration tool is designed with an intuitive working interface. It provides a complex-free platform to flawlessly connect Thunderbird / Apple Mail / Entourage to Office 365. A pleasing and self-descriptive interface of MBOX to Office 365 is rendered to make product worthful for novice users too. The data can be transferred with the maintenance of email folder structure. An additional option is rendered to keep MBOX inbuilt folder hierarchy intact throughout. Always the email fidelity is a major aim of Entourage to Office 365 Migrator tool. It carries entire process without a single data loss. MBOX to Office 365 Migrator Tool Allows User to Export Only First 25 Items/Folder in Free Demo Version. Explain the working of MBOX to Office 365 Migrator Tool? 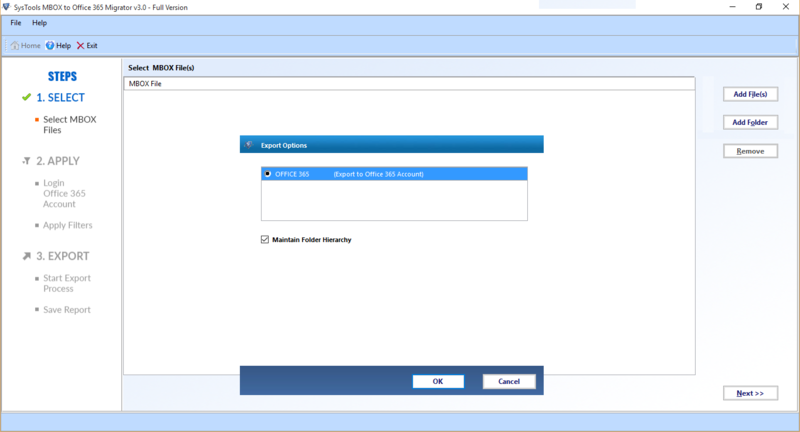 Step 1: Install & run MBOX File to Office 365 Exporter Tool. Step 2: Click on Add File/Folder option to add MBOX file(s) and then, click on Next button. 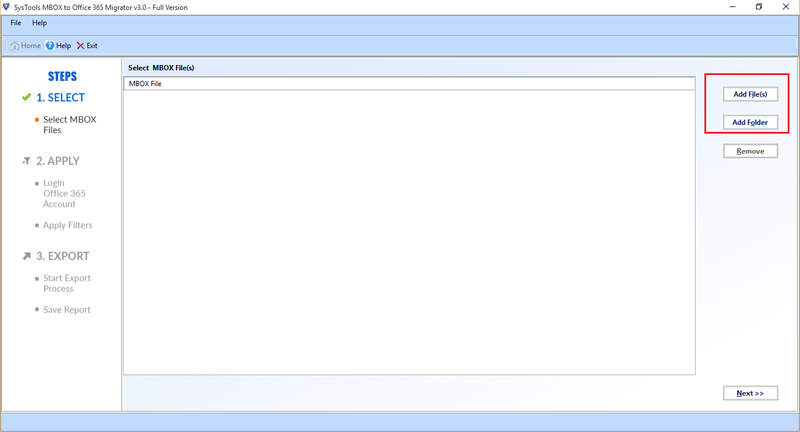 Step 3: Click on Office 365 radio button. Choose With or Without Impersonation option. 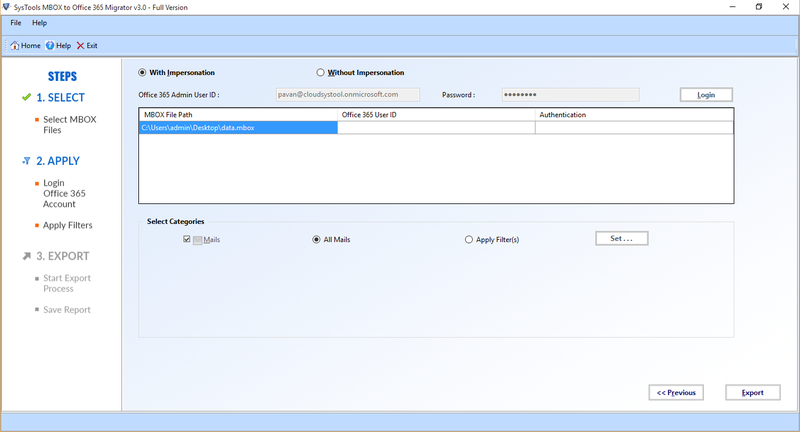 Step 4: After that, provide the credentials for the O365 account and validate it. Step 5: After successful validation, apply Date Range filters to select the data items to migrate. Step 6: Click on Export button to proceed. Step 7: You can also save Export Report in CSV file format. After completing the process, you can access your data in Office 365 account. Is it possible to import MBOX file to Office 365 with help of this converter? Yes, our software supports MBOX file of all its email clients. A .mbox of Apple Mail, Thunderbird, PocoMail, Entourage, etc., is easily supported by this importer. I have forgotten the password of the O365 admin account. Is it still possible to use impersonation feature of your product? No, Office 365 administrator id and password is mandatory to utilize impersonation feature of our software. Will I be able to export Mac mail to Office 365 account on Mac OS? No, our MBOX to Office 365 conversion tool is Windows-based and works on all editions of it. You can extract MBOX file from Apple mail program and then on Windows platform, use our tool for task accomplishment. Does your software uploads emails from 15 MBOX files to Office 365 account all at once? Yes, the Thunderbird MBOX file to Office 365 importer provides a feature of batch migration. You can utilize Add Folder option to browse multiple source files in a collective manner. "I cannot select any one feature and commit that it is the best feature of this product. Each and every function provided in this MBOX File to Microsoft Office 365 converter is amazing and useful. The interface of migration product is easy-to-use and every step is easily understandable. I am thankful to the developers that they came up with this type of simplified and professionally beneficial product." "Since a long time, I was using Apple Mail to Office 365 Importer of some other brand. It used to be a stressful moment for me to import MBOX file to Office 365 user account with that software. One day I discussed the same with my friend and he asked me that I should give a try to this FreeViewer product. I tried its free version and currently, now it's like a game for me to carry out migration." "Migrating from one email client to other is a difficult task. But after using MBOX to Office 365 Migrator tool, my perception is changed. Now, I can easily migrate data from a specific Date Range into O365 accounts. Thanks, FreeViewer team for making work so easy." "I have hundreds of MBOX files that I need to transfer to O365 account. I don't know any method to do such task. Then, one of my friends suggested me to use this tool. With the help of MBOX File to Office 365 Exporter software, I was able to migrate entire data items to the domain account. I want to thank FreeViewer team for supporting and helping me."